US firm Legal Brand Marketing managed to increase click-through rates by 89%, while halving its cost per lead, after switching to a mobile-only lead generation strategy. The company delivers qualified leads to law firms and DUI attorneys, but found that the search landscape had changed, particularly following Google’s shift towards giving localised results more weight. In response, LBM developed a new marketing strategy that could deliver a low enough cost per lead, while still returning a profit. A core secondary objective was to devise an approach which would reach potential leads on the platform they use most. Additionally, LBM was keen to obtain more insight into the success of its phone service. LBM looked to Webtrends to provide the research, data and strategic insight needed for the development of its new marketing strategy. After comparing the cost per conversion on desktop and mobile, LBM discovered that targeting people on a mobile platform was 35% more cost effective than its current desktop marketing strategy. In response LBM created a new strategy including a mobile optimized landing page, a mobile-friendly form and a second opportunity for the visitor to click and call the company’s 24-hour phone service. Additionally, it placed phone extensions in LBM’s ads and used Google call forwarding to track call time and length. LBM’s new mobile marketing strategy resulted in an 89% increase in click-through rates and cut the cost per lead by more than 50%. It wanted to convince customers that mobile booking is simple, fast and reliable. To do this, KLM needed to change attitudes and build trust in booking flight tickets via its mobile site or the KLM app. It needed the initiative to be a test bed for new mobile marketing techniques such as its mobile passbook, location-based notification and the retargeting of visitors across mobile. During a campaign period of three weeks, KLM offered an incentive of free lounge access to anyone who used its mobile booking engine. Customers received their lounge access in the form of a mobile coupon within their passbook for Apple users and in their Google wallet for Android users. These apps then sent a location-based push notification when the customer was in the vicinity of the lounge, so they were reminded to use the coupon. KLM created a responsive campaign page, which displayed a ticker for how many vouchers had been claimed. As a result of the campaign, which initially targeted the UK, Netherlands and Germany, KLM saw a 17% increase in visits to its mobile site, which generated 34% more bookings and 38% more mobile revenue. 13.1% search engine advertising (SEA). 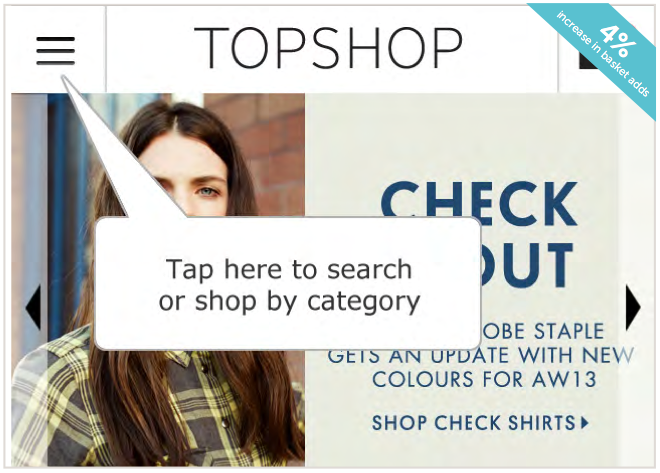 After redesigning its mobile site, which involved a significant change to the navigational structure, Topshop ran a series of tests to optimise the user journey. Topshop changed its homepage and, using real-time feedback from Qubit’s Visitor Opinion tool, highlighted a number of areas for improvement. The retailer wanted a way of testing whether several small changes to its product page would have any positive effects and wanted to test these changes before allocating extensive IT resource to it. A navigational pointer was shown to new mobile users on their first visit, showing for five seconds as they entered the site. The pointer highlighted where the new menu was, helping visitors navigate to other pages. Using this data alongside the qualitative feedback, Topshop designed four different search variations, testing both changes in copy and the addition of a border to the search box. The test was split evenly across all users. Optimisation of the search tool is important as quantitative data found that people using Topshop search typically convert 10 times higher than those who don’t. The retailer also tested changes to the size selector, the ‘details’ and ‘delivery’ tabs, the ‘added to bag’ confirmation pop-up, and buttons such as the ‘size guide’, the ‘add to bag’, and the ‘check stores’. The new mobile layer resulted in a 4% increase in products added to baskets, while the search bar generated a 5.8% increase in conversions. The product page changes generated between 9%-11% increase in conversions. British supermarket chain Asda is the UK’s second largest chain by market share, and has more than 500 UK stores. The retailer’s objective was to meet the growing use of mobile by building an app that made shopping quicker and more convenient for its customers. 10% of grocery online shopping orders through the app. Industry leading usability and functionality. Increased convenience for Asda mums (busiest and most savvy shoppers). These aligned with Asda’s long-term objective of creating 'stores without walls'. Customer feedback showed that customers wanted an app that was simple and easy to use, so the resulting design included a recipe finder, barcode scanner, and a store locator. The approach was to let customer experience drive the technology, rather than vice versa, and new features have included live petrol prices and merchandised banners. Mobile now accounts for 18% of all grocery home shopping sales - 90% of this from the app. Asda app shoppers are twice as likely to become loyal, repeat customers. Shopping frequency for mobile is 1.8 times higher than desktop. 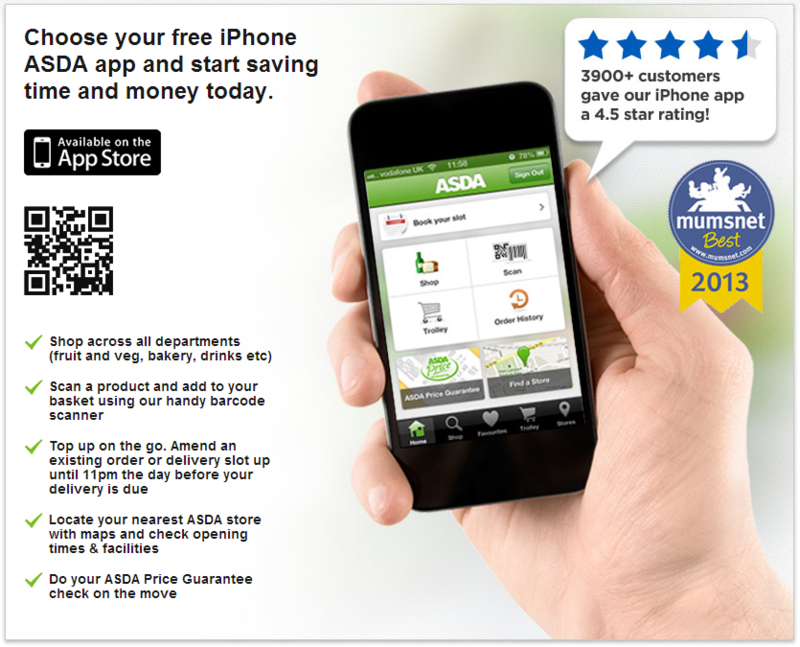 The Asda app won a ‘2013 Mumsnet Best award’, getting a 5-star reviewer rating. The app was Google’s ‘staff pick’ over the Christmas period. As part of a wider programme to reinvent Argos as a digital leader, the retailer wanted to deliver a truly multichannel experience, encompassing a website, mobile-optimised site, iPhone app, iPad app, and Android phone and tablet apps. Mobile proposition - to offer convenience and immediacy to new customers, providing competitive advantage in attracting customers on the move. Stores - refurbishment programme would be designed for the multichannel customer. iPad app - reposition Argos from a catalogue-led business to a digitally-led business. A three-year investment programme founded on customer research and clear corporate objectives was embedded business-wide. The multichannel journey capabilities mean that customers can now have 14 combinations of order and fulfilment to suit their needs; they can easily start their journey in one place and pick it up in another. The new iPad magazine showcases the retailer’s range and inspires new customers. Multichannel sales penetration increased to over 50% of total sales, with Argos.co.uk receiving 440m visitors per year. The internet accounted for 42% of total company sales and 'Check and Reserve' was Argos’ fastest growing channel. The iPhone app has been downloaded over 2.5m times, the Android app over 625,000 times and the iPad app over 450,000 times. The iPad app has already exceeded sales targets, achieving more than double the target set at launch and contributing to the 12% of total company sales now accounted for through mobile channels. Search channels continue to grow with SEO achieving non-brand growth of 32%. PPC has grown revenue over 60%. Email visits have grown by 49%. Performance marketing campaigns have supported visit growth of 15%. We’ve written a lot about Very.co.uk recently, including a review of its new iPhone app. In this case study the retailer worked with Somo to create an integrated, multichannel campaign that aimed to boost sales in the run up to Christmas 2014. The campaign led to a 45% increase in mobile sales year-on-year and ROI of more than 15:1. Are you paying attention to your mobile marketing yet? After years of being the next big thing, mobile might finally be the current big thing. But there is a big problem–most people don’t know how to prove it. A joint study by the ANA (Association of National Advertisers) and MediaVest shows marketers are excited about opportunities for mobile marketing but frustrated about the ability to prove return on investment (ROI). Are you one of them? To help alleviate the frustration, here are case studies. They cover opportunities from mobile optimized websites, mobile apps, mobile search, mobile ads, MMS, SMS, QR Codes to social media. They also prove ROI is more often achieved when marketers pursue mobile with a specific business purpose rather than mobile for mobile’s sake. CARITAS HOME CARE: Boston-based home healthcare agency used mobile health devices to enhance communications and data collection with its 150 mobile clinicians. Caritas documented how the mobile devices were able to save 19,200 hours or 98 hours per clinicians per year. Although Caritas didn’t release salaries of clinicians, if we estimated $50/hour, which would be conservative, Caritas saved $960,000. If the devices were $100 each for 150 clinicians at $15,000, which would also be conservative, the ROI would be 64-to-1. DUNKIN DONUTS: Used SMS (short message service) or text messaging to increase store traffic and drive sales. The SMS campaign offering mobile coupons. It increased store traffic +21%. HAIR CLUB: North America’s leading provider of hair restoration solutions for men and women created a mobile website with one purpose, to get mobile phone users to “click-to-call” for more information. Their “click-to-call” button goes to a live sales person within seconds. Once a call is made, their close rate goes up exponentially. ROI for the mobile website was 30-to-1. HARLEY-DAVIDSON: Wanted to maintain visibility with current customers and add new customers and revenue through a holiday promotion. They sold HD related merchandise through a Route 66’s mobile club. Communications of the 12 Days of Christmas campaign were promoted through a mobile social media campaign. Sales increased 250% on helmets; 16% on leather jackets and there were significant increases in holiday dealer traffic which was also an objective. JANSSEN (PSORIASIS 360): Launched a mobile phone app to help psoriasis patients track the severity of their condition. The index helped them know when to seek professional care and allowed their medical professional assess to the severity of their patient’s condition. Janssen also opened a Facebook page, which they moderated for regulatory reasons, to let patients tell personal stories and had over 30,000 posts and comments. According to Janssen, the investment in the mobile app overachieved ROI but more important delivered the right therapy to the right patient at crucial times. MCDONALD’S: Designed a ‘restaurant finder’ app to enable consumers to find a late-night McDonald’s. 2/3’s of its restaurants close at 11pm. McDonald’s employed location-based technology and geo-targeted above-the-line messaging, to avoid sending potential customers to a locked door. The app was downloaded 1,300,000 times over the course of the campaign, and when the sales uplift was calculated, the campaign delivered an ROI of 2:1. PETCO: Expected the creation of a mobile website and a mobile ad campaign would be made up by higher conversion rates to coupons and offers. Mobile coupon redemption outnumber online coupon redemption by 5 to 1 more than paying back the cost of the website and ad campaign. PIZZA HUT: Created a mobile optimized website, integrated with Pizza Hut’s back-office systems and all devices had a user experience tailored to each device. By the end of the first week after going live, the site accounted for 10 per cent of all online orders increasing at a rate 60 per cent each week. ROY’S RESTAURANT: Used a paid search mobile-only campaign that enabled them to budget, bid, target, and track their mobile performance separately from their desktop AdWords campaigns. They also focused on Google’s click-to-call phone numbers in local ads on mobile devices and hyperlocal advertising, They achieved an astounding 8-to-1 ROI by focusing solely on mobile advertising. VEGAS.COM: Noticed that mobile visitors to their destination‐based travel and entertainment booking website didn’t stay long. They created mobile versions of the: 1) Homepage, 2) Category pages and 3) Hotel room search tool with special functionality to improve the mobile customer experience. An improved mobile experience resulted: 1) 22% lower bounce rate 2) 16% more page views and 4% higher conversion rate. VERIZON: Used QR codes to take store customers that scanned the QR code through to a competition to win a smartphone, via sharing on Facebook. If one of those Facebook friends brought a Verizon mobile, the original customer would get a free smartphone. A pretty nifty promotion that generated $35,000 in additional revenue during the week of the promotion, with a mere $1,000 investment. The promotion generated a 200% in smartphone sales, a staggering figure that can be attributed to a QR Code. WINNEPEG HEALTH AUTHORITY: Used SMS to get adults 18-24 tested for sexually transmitted infections (STIs), increase awareness of STI incidents and remove false perceptions about testing. Text the keyword PEEINACUP to the short code 82442 or go to www.peeinacupwinnipeg.ca for clinic locations and a chance to win $1,000. Over the course of the four-week campaign, more than 10,000 people visited the Web site and 825 people entered the contest, which is 1.2 percent of the total target population in Winnipeg. WOOGA: The world’s third largest social game developer. Among its popular social game titles is Diamond Dash, a colorful jewel blitz game that challenges players to match three or more of the same colored gems in under 60 seconds. Wooga ran sponsored stories in Facebook mobile news feeds that displayed when one of their friends had played Diamond Dash for at least four minutes or twice during the previous month. This campaign strategy generated great success for Wooga, from increasing installs by over 25% to lowering the cost-per-install by 10%. zPIZZA: Had a business goal to deliver at least 1,000 heavy‐use customers who spend $50+/month for each of their restaurant locations. They also had a loyalty program, zTribe, to identify regular customer and reward them with sweepstakes, cash prizes and inform them of new product. zPizza decided to use SMS messaging to improve registration and timeliness of the zTribe rewards and product information. The result was a 5% improvement in registration and a +106% in conversion for program participation. Does your company use mobile marketing? Do these case studies prove ROI to you? Do they help teach how mobile marketing could be better used for your business? Rob Petersen is an experienced advertising and marketing executive and President of BarnRaisers, a full service digital marketing agency that builds brands based on proven relationship principles and ROI. He is on the MBA Faculty of Rutgers CMD and is the author of two books on digital marketing.